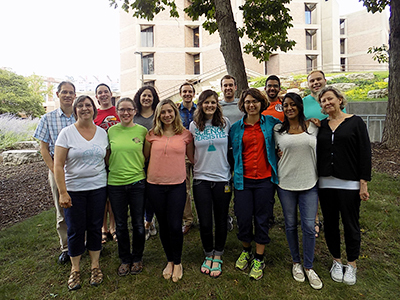 The REU in Microbiology at The University of Iowa seeks to foster the careers of the next generation of microbiologists. We do this by providing an intensive 10-week research experience for bright and ambitious undergraduates who are considering a PhD in microbiology or an allied discipline. In 2019, we expect to support 8-10 participants. We hope that this experience will encourage students to pursue a career in basic science and give them the skills they need to succeed in that career path. The focus of the program is a hands-on research project conducted under the guidance of faculty and graduate student mentors. A range of research projects will be available, including basic mechanisms of bacterial and viral gene expression, virus structure and assembly, biofilm formation, microbial development, and prokaryotic cell biology. Students will also attend lectures to broaden their understanding of microbiology and educate them about graduate school and career options. Participants conduct full-time, hands-on research in microbiology, microbial genetics, or molecular biology. Access the department research projects and a list of recent summer REU projects can be found here. At the end of the summer students present their findings in a campus-wide poster session. Program lasts for 10 weeks (May 20-July 26, 2019). Participants receive a $5,750 stipend plus a $630 supplement for incidental expenses. On-campus housing is provided at no cost to the participants. Travel costs are paid by the program. Will be returning to their home institution for at least one semester of undergraduate study before graduation. Are interested in pursuing graduate school and a career in biological research. Are United States citizens or permanent residents (hold a green card). Have limited access to research opportunities at their home institution. Prior research experience is NOT a requirement. Questions? Try our FAQ. You can also send an email to us at undergrad-micro-info@uiowa.edu or call us at 319-335-7807. Our application deadline has passed. Please check back in December 2019 for application information about Summer 2020.